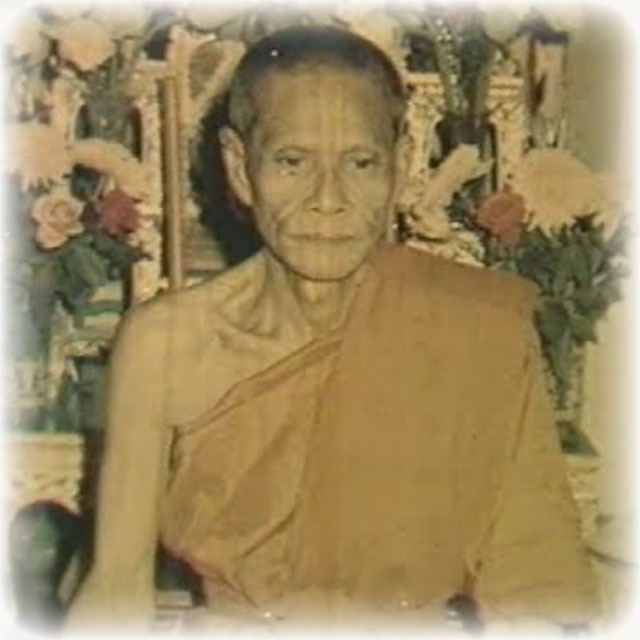 Luang Por Nueang Gowito (Pra Kroo Gowit Samutrakun), of Wat Jula Mani, in Tambon Bang Chang, Amphoe Ampawa, in Samutr Songkram Province, was one of the most famous Gaeji Ajarn Guru Monks of his Era. He was the first initiate and apprenticed in magic to Luang Por Kong (Wat Bang Gaporm), Luang Por Chaem (Wat Jula Mani), Luang Phu Jai (Wat Sadej), and many other famous Sorceror Monks of Historical Fame, and received their powerful Wicha in Lineage Transmission. 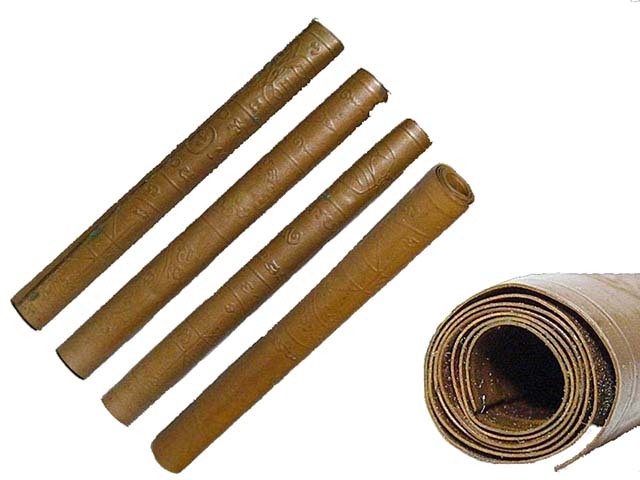 His Wicha was renowned for being manyfold and masterful, having learned from so many different lineage masters. Luang Por Nueang studied hard and attained his Masters Degree in Dhamma in the year 2479 BE, and in this same time period had also developed immense mastery in Vipassana Kammathana practices, and Puttakom (Buddha Magic). 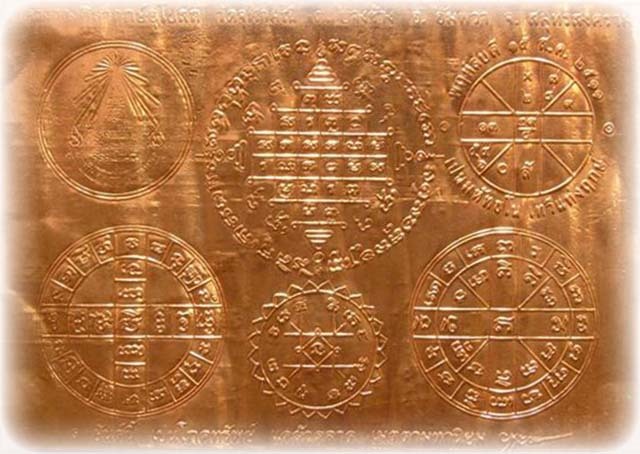 He advanced very rapidly, due to extremely diligent efforts, and putting in his utmost perseverance in both his academic study and his manifest practices. 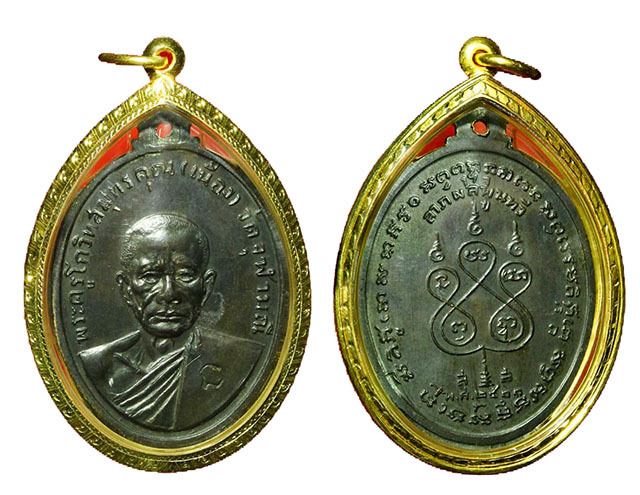 He was also fortunate to have the Great Luang Por Kong of Wat Bang Gaporm as one of his Kroo Ba Ajarn in Buddha Magic, whose Rian Luang Por Kong Coin holds position within the Top Five ‘Benjapakee’ Monk Coin amulets of all time. Wat Jula Mani is an ancient temple, which was built around the period between 2172 BE and 2190 BE, in the time of the times of the great Ruler Jao Prasat Tong. It was originally called ‘Wat Mae Jao Tip’, and is a temple of Historical importance related to the Bang Chang branch of the Chakri Dynasty family lineage. The temple originally was built with teak wooden buildings, which rotted over time, and so it was in the time of Luang Por Nueang when they were repeaired and replaced by much more long lasting constructions. 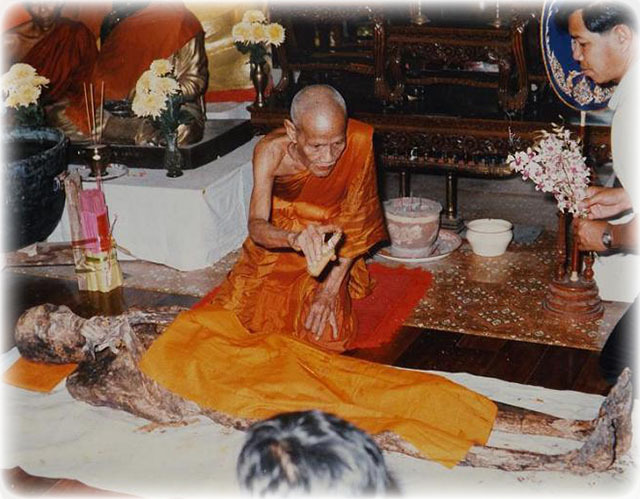 This was also one of the factors which led to Luang Por Nueang becoming the most beloved and well remembered Abbot of Wat Jula Mani, and for which the local devotees loved him so much, for his merits. 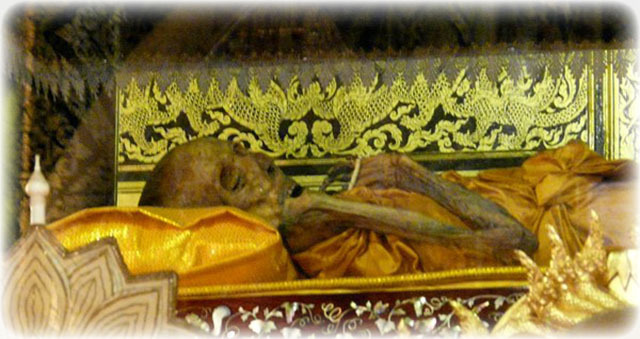 in the year 2530 BE Luang Por Nueang became ill, and finally passed away on 27th November 2530 BE at the age of 78 years old, after 56 years of ordained life. He is remembered for his powerful amulets, his great teachings in Dhamma Practice and Vipassana, and his attainments in improving the temple of Wat Jula Mani during his lifetime. 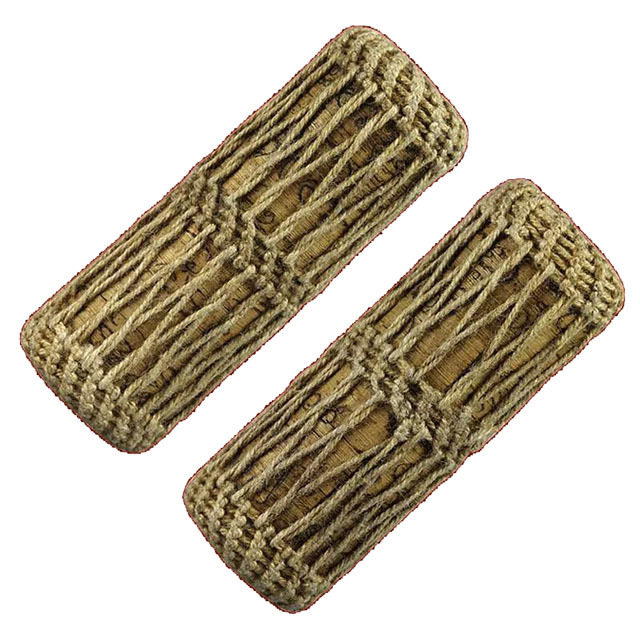 His powerful amulets are both rare and jealously guarded by his devotees, many of whom also follow and collect the amulets of his successor Pra Ajarn It, who has continued the Lineage Wicha and diligent practice in admirable fashion. 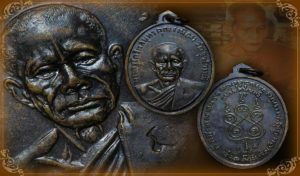 Amongst the most famous amulets of Luang Por Nueang we find the Takrut Tone, Takrut Bailan, Takrut Look Om, Rian 2511 BE Monk Coin. Amulets made or blessed by Luang Por Nueang are considered to have high Puttakun Power and posess powerful magic, be they ones he made himself, or amulets where he attended the blessing ceremonies to assist in.